One of my favourite aspects of living in Northern Ireland is the speed at which I can escape the city and lose myself exploring the coast, forests and mountains. The Mourne Mountains are a particular favourite place of mine to unwind, as you might have noticed from my Instagram posts! With such a variety of peaks to climb, vistas to capture and with quickly changing weather the view is never quite the same. On a recent visit, I took a new route to reach the base of Slieve Binnian starting from Little Carrick rather than my usual route from Silent Valley. The day started wet and very cloudy, and after a couple of hours hike in the mist, I had debated whether to carry on (a cosy café hot chocolate seemed very appealing when the clouds closed in yet again). However, after a short while, the rain stopped and the swirling cloud created a whole new experience, revealing brief glimpses of the dramatic landscape before closing up again and shifting around. As the hike continued, more of the view became exposed until finally reaching the gap between Binnian and Slieve Lamagan the cloud suddenly lifted revealing the view down Silent Valley and across to the face of Ben Crom. 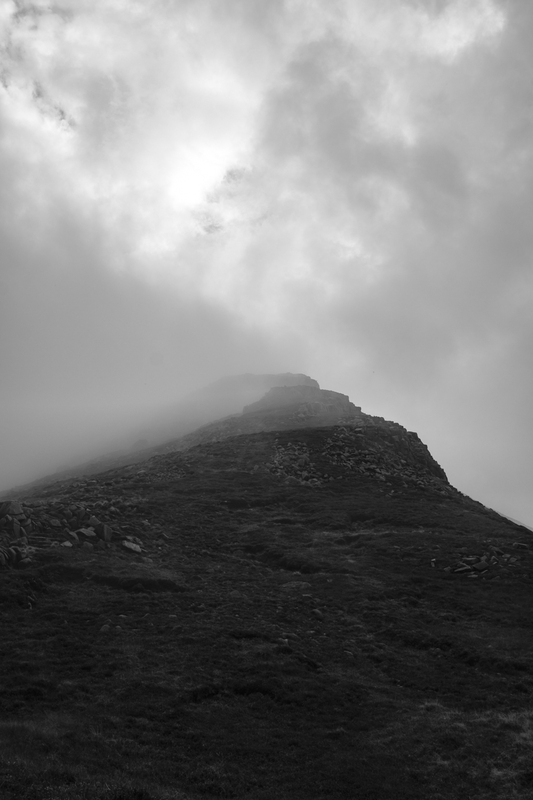 The swirling clouds made for some long moody monochrome shots using the mist to partially conceal and add mystery to the peaks. As always, it just goes to show that a little bit of rain shouldn’t put you off a hike with your camera! I hope to remember this next time a wet and grey gloomy day dawns, and rather than heading off for that hot chocolate I will race off to enjoy the challenge of wild weather!